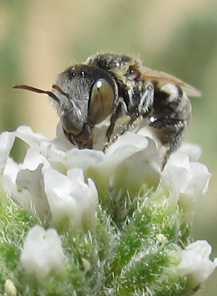 Female of Haetosmia circumventa collecting pollen on a flower of Heliotropium (left); Heliotropium (Boraginaceae) is the exclusive pollen source of the Haetosmia species (right). Fotos Claudio Sedivy and FlowersInIsrael.com. The genus Haetosmia occurs in the Palaearctic and Afrotropical region (Müller & Griswold, 2017). It contains 6 described species, 5 of which occur in the Palaearctic. Haetosmia is a member of the Osmia group (Praz et al., 2008b). Most phylogenetic analyses placed it as the basal branch within the Osmia group (Praz et al., 2008b; Sedivy et al., 2013c), although in some analyses it was sister to a large clade consisting of Wainia, Osmia, Atoposmia and Ashmeadiella (Praz et al., 2008b). As all Haetosmia species seem to be restricted to sandy ground (Mavromoustakis, 1954b for Haetosmia vechti; A. Müller and C. Sedivy, personal observation for H. circumventa; C. Praz, personal observation for H. brachyura) and the females possess long bristles on tibia and tarsus of their forelegs, which might be an adaptation to flip away sand during nest excavation, species of Haetosmia were supposed to nest in the soil. Indeed, H. vechti was recently found in Israel to nest in excavated burrows in sandy soil (Gotlieb et al., 2014). Its nests were found to consist of an excavated burrow ending in a small chamber, which contains a small cluster of urn-shaped cells built from masticated leaves partly mixed with small pebbles and sand grains. All species exploit flowers of Heliotropium (Boraginaceae) as most probably exclusive pollen source. The females have long, apically curved and capitate bristles on the second segment of their labial palpi (Peters, 1974). As already assumed by Peters (1974), these modified bristles serve to extract pollen from the tiny and narrow-tubed Heliotropium flowers (Gotlieb et al., 2014). 1974 Osmia (Haetosmia) brachyura altera Peters, Senckenbergiana Biologica (Frankfurt), 55: 294. Combination Haetosmia altera in Müller & Griswold (2017). Type material: Holotype f, “Gulbahar, 1700 m” [Afghanistan], SMFD (Frankfurt); paratypes mm, ff. Distribution-Southwestern Asia: AFG, IR, PAK. Northern Asia: TM, UZ. Identification-Keys, Descriptions: Peters (1974); Müller & Griswold (2017). Flower preferences: Probably narrowly oligolectic on Heliotropium (Boraginaceae) (Müller & Griswold, 2017). 1875 Osmia brachyura Morawitz, Travel to Turkestan by A. P. Fedtschenko, p. 97. Type material: m(m), “in deserto Kisilkum” [Turkestan].-Combination Anthocopa (Haetosmia) brachyura (Morawitz) in Zanden (1988b: 119). 1875 Osmia latipes Morawitz, Travel to Turkestan by A. P. Fedtschenko, p. 97. Type material: f(f), “in deserto Kisilkum” [Turkestan]. Type species of Haetosmia Popov.-Combination Anthocopa (Haetosmia) latipes (Morawitz) in Popov (1952b: 103).-Synonymy in Peters (1974: 293). Distribution-Northern Asia: TM, UZ; Turkestan. Identification-Keys, Descriptions: Ducke (1900); Peters (1974); Popov (1952b: 103); Müller & Griswold (2017). Flower preferences: Most probably narrowly oligolectic on Heliotropium (Boraginaceae) (Gotlieb et al., 2014). Additional flower records: Salsola richteri (Popov, 1960b). 1974 Osmia (Haetosmia) circumventa Peters, Senckenbergiana Biologica (Frankfurt), 55: 297. Type material: Holotype m, “Gran Canaria, Maspalomas, Dünen” [Canary Islands], SMFD (Frankfurt); paratypes mm, ff.-Combination Anthocopa (Haetosmia) circumventa (Peters) in Zanden (1988b: 119). Distribution-Northern Africa: E(Ca), ET, LAR, MA. Southwestern Asia: IL, OM, SA, UAE. Extralimital: Afrotropic (Mauritania, Niger, Sudan). Identification-Keys, Descriptions: Peters (1974, 1975: 54-55); Müller & Griswold (2017). Flower preferences: Narrowly oligolectic on Heliotropium (Boraginaceae) (Hohmann et al., 1993; Gotlieb et al., 2014). Additional flower records: Neurada procumbens (Peters, 1974). 2017 Haetosmia pakistaniensis Müller & Griswold, Zootaxa, 4358: 359. Type material: Holotype f, “Baluchistan province, Pishin” [Pakistan], Smithsonian Instiution; paratypes m, f.
1974 Osmia (Haetosmia) vechti Peters, Senckenbergiana Biologica (Frankfurt), 55: 294. Type material: Holotype m, “Teheran-Evin, Institutsgelände” [Iran], SMFD (Frankfurt); paratypes mm, ff.-Combination Anthocopa (Haetosmia) vechti (Peters) in Zanden (1988b: 119). Distribution-Europe: GR?. Southwestern Asia: IL, IR, JOR, TR. Northern Asia: TM. Identification-Keys, Descriptions: Mavromoustakis (1954b: 267-268, as Osmia latipes var. ); Peters (1974); Müller & Griswold (2017). 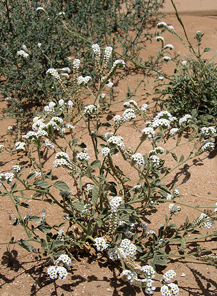 Flower preferences: Narrowly oligolectic on Heliotropium (Boraginaceae) (Mavromoustakis 1954b; Gotlieb et al., 2014). Additional flower record: Gymnocarpos decander (Gotlieb et al., 2014).